St Mary's church is located in the heart of the village of Southery, just off the main road through the village on Churchgate Street. The Church is usually closed outside service times but the keys are readily available from George Savage (01366 377286) or David Starling (01366 377342). Sunday's at 9.15am we usually celebrate the Eucharist together, with an 8am Eucharist once a month. We also have a united service with the Methodist Chapel on some Sundays. See our worship section for further details. Worship: Services are taken from the Church of England's Common Worship Order One in modern language with some seasonal variation. On Sunday's we usually celebrate the Eucharist togeth﻿er. ﻿ Hymns are usually accompanied by CD.﻿ ﻿ The Eucharistic prayer is usually said, rather than sung. Churchmanship is liberal catholic with the Priests wearing Eucharistic vestments. Bells: The church has a bell which is chimed for regular services and special occasions. Facilities: The church has a 'community area' at the back of the building, with a kitchen and a toilet that can be used by the disabled, plus baby-changing facilties. The church has an induction loop for hearing aids, ramp access, and there is plenty of room for parking. 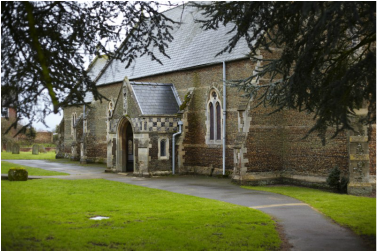 History: Built in the nineteenth century the church was designed in the 'catholic' tradition of the Church of England, with the reserved sacrament, a magnificent Rood Screen, and stations of the cross. Churchyard: St Mary's churchyard is closed for burials, but there is a municipal cemetery in the village.